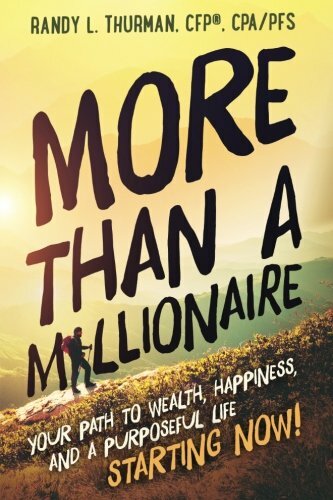 More than a Millionaire: Your Path to Wealth, Happiness, and a Purposeful Life--Starting Now! What kind of life do you want to live? Do you have enough money to realize your dreams? Is realizing your dreams enough, or do you also want to make a meaningful contribution to the lives of others? With money you can be a millionaire. You’ll be financially independent and have the freedom to spend your days as you like, and buy toys, trinkets, and travel for yourself and people you love. But money also gives you time and resources to make the world a better place…to contribute to your community and be generous in ways that will bring the kind of happiness that money alone can’t buy. That’s what it means to be More than a Millionaire. With more than 30 years of experience as a financial advisor, Randy L. Thurman has identified a tried and true path to wealth—as well as happiness. The key is to start—start from where you are today, and get the right information to make sure you’re heading in the right direction. In More than a Millionaire you’ll find: • 5 simple steps you can take, starting today, to protect your money and secure your financial future • How to create a spending plan that will let you enjoy the money you have now, while you build a nest egg for tomorrow • How to identify goals that are right for you—and actually achieve them • The fundamentals of investing, and how you can minimize your risk • 18 traits of the wealthy and happy • 3 strategies to increase your income and find a faster route to becoming More than a Millionaire! You can have it all. Enjoy yourself today and be financially independent in the future—while you create a life filled with meaning and purpose. Are you ready to get started? If you have any questions about this product by Master Key Publications, contact us by completing and submitting the form below. If you are looking for a specif part number, please include it with your message.